Last day of the conference! Half day only today. Antenna House makes an XSL-FO processor called XSL Formatter (in DITA we mainly create PDFs with it). One of their guys gave a talk on a new tool they have created that compares PDFs. Doesn’t sound like much but this tool compares the PDFs pixel by pixel and is capable of finding and flagging the slightest changes. It turns out that you can’t just do a diff on the two FO files used to create the PDFs and have it tell you all the differences there could be in their resulting PDFs. There can be many other factors involved. And the Adobe Acrobat diff tool won’t do it all either, and also has a limit on the number of pages you can compare. Apparently the only way to do this before was to visually compare each page of each PDF. Frank Miller of ComTech gave a talk on using RelaxNG with DITA. RelaxNG is a simplified XML schema language that is equivalent to DTDs and W3C Schemas, but is simpler and easier to use than either of those, especially in the area of DITA specializations. RelaxNG is so superior that the DITA Technical Committee has decided to use it as the standard schema for DITA, hopefully in the upcoming DITA 1.3. But they needed someone to write a script that converts a RelaxNG schema into equivalent DTDs and W3C Schemas, so I volunteered to do this. The final session was a long one, a panel discussion on the DITA OT with several people including Robert Anderson, the main architect of the OT. It was really good and I learned that they need help in many areas, not just programming and bug fixing. Documentation is one thing that is needed. If you’re interested in helping, contact Kristen Eberlein. And then it was over. I learned a ton and made many excellent contacts. Highly recommended if you’re interested in DITA. Your guest blogger signing out now, it was lots of fun and thanks for having me! It was the second day of the conference and I was not fully awake yet, but my first talk of my day had the demanding name of “Managing Cross-Publication Links Using Shared Key Definitions.” It was by Eliot Kimber, and he asked us if we were ready for the hardest part of DITA. So I tried to rev up some cognitive horsepower as best I could. Kimber is deeply into this subject and he showed many slides of all text and no graphics while precisely describing this area, its background and its problems, and it was really quite good. I almost feel like a link expert now. Casey Jordan, founder of the easyDITA CMS, gave a talk about applying the programming practice called “continuous integration” to documentation. It was very technical and went at a fast pace (these talks last only about 35 minutes with a few minutes of questions, so presenters usually have to hustle). Jordan called it documentation-driven development. 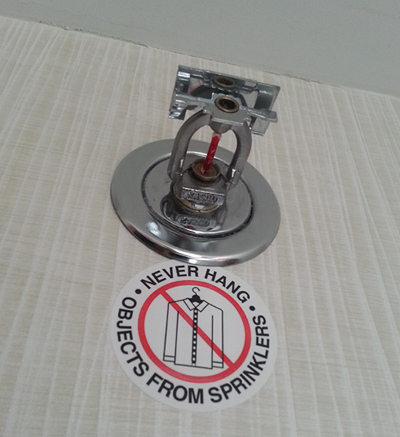 This is an interesting idea and would probably work well if you could implement it properly. Interesting technical details: He uses the open source exist-db XML database, and uses XQuery to query it. Kristof Van Tomme from Belgium gave a nice overview of late-model web development techniques that make it easier to support the profusion of mobile screen sizes some of us deal with today. These techniques are called responsive design and adaptive content, and he talked about how to implement them with the Drupal content management framework. There was some DITA in there too, because Kristof continues to do work on integrating DITA with Drupal. This translation talk was interrupted by someone who came in and said we had to move to another part of the building because of a suspicious package found downstairs. We stopped everything and quickly moved out. It turned out to be a false alarm and we got back to our talk about 10 minutes later. 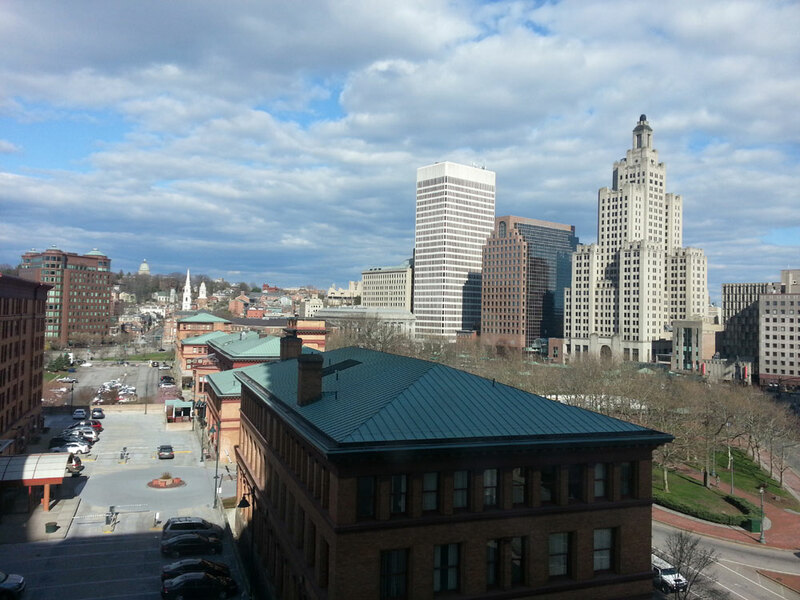 People are understandably spooked about recent sad events in Boston, and Providence is about 50 miles from there. Later I saw a talk on efforts to standardize change markup in DITA (and XML in general). And then a talk on ways to sell a marketing department on using DITA. Separating designers from their InDesign is sure to be an adventure. End of conference day, nothing else on the agenda. I was lucky enough to be invited to a very nice dinner with drinks at a restaurant by a generous CCMS vendor. Last day of the conference tomorrow! First day of the conference! Here is the crowd at the keynote presentation. 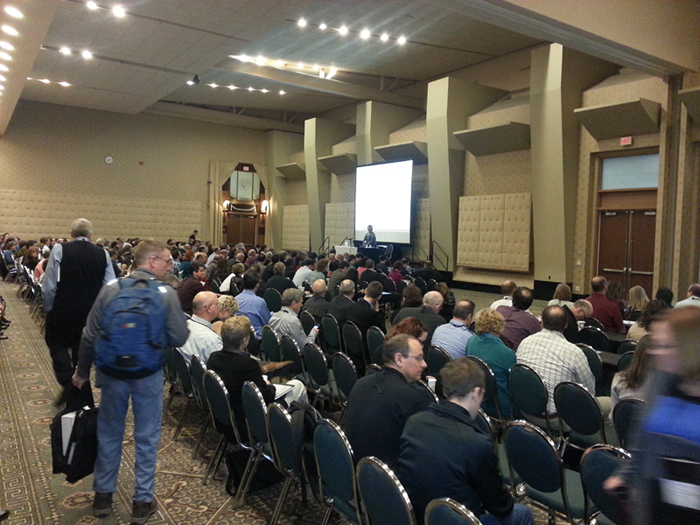 We were told that this is the largest attendance ever for this conference, at 345. Then the regular presentations started. I chose Severin Foreman’s talk on how he became an information architect and what that entailed. I realized that being a DITA IA probably requires a good many people skills as well as technical skills. I next attended a presentation called “DITA Mythbustin'” by Tom Magliery of JustSystems, makers of the XMetal XML editor. He went over a bunch of beliefs about DITA such as “It’s only for large companies” (he said false) and “It’s too complex” (he said true, but not hopelessly so). I saw another talk or two and then there was lunch, where they had a bunch of tables set up for “Birds of a Feather” lunches at each table. One person at each table moderated a conversation about a different DITA-related topic, and there were dozens of them. I chose one where Edwina from Kaplan Publishing in NYC talked about getting DITA output from InDesign. After lunch I saw a talk by two guys from Citrix (Patrick Quinlan and Dustin Clark) who have created this wild DITA setup where a lot of writers author in plain MS Word but use a few special codes in the text, and then they run it through this custom web-based system that converts the Word files into DITA topics, which are then output to various things like PDF and mobile-friendly HTML5 using the DITA Open Toolkit. Then I heard Robert Anderson of IBM talk about what’s coming in the next in the next version of DITA (1.3). They’re trying not to overwhelm people with as many changes as were made in the 1.2 version, but there are a few interesting things coming. I attended a talk by Matt Kaatman, who gave a fascinating (to me) history of the DITA Open Toolkit and talked about how you can help with its development. All help is welcome, and I would like to do this at some point. 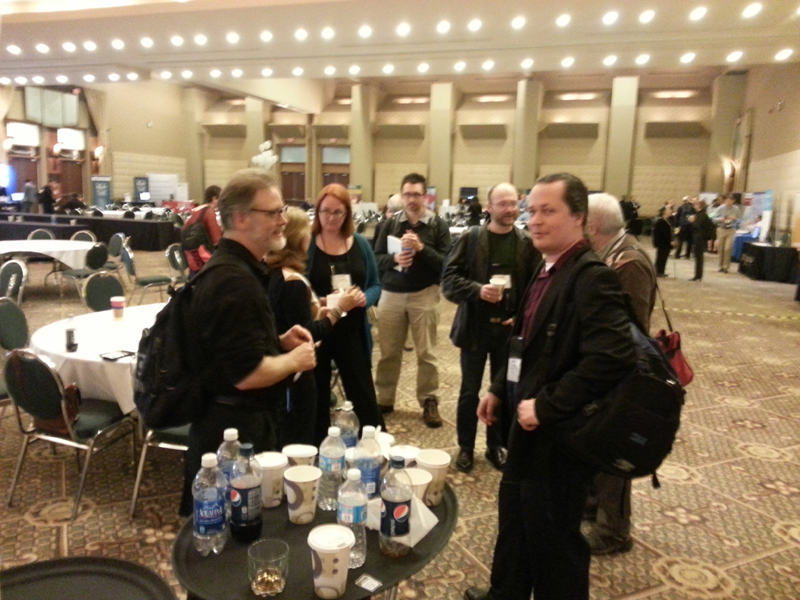 Here’s a shot of many (or maybe even all) of the members of the OASIS DITA Technical Committee standing around yakking on a break. From left to right: Eliot Kimber, Amber Swope, Kristen Eberlein, Kristof Van Tomme (not on the committee), Michael Priestley, the back of Don Day’s head, and Robert Anderson looking slyly at the camera. Robert is the chief architect of the DITA Open Toolkit. As if all of that wasn’t enough, at the end of the day there was a vendor’s reception, which meant more alcoholic beverages and some really good hors d’oeuvres like coconut shrimp. I went around to the vendor booths with my beer and got a bunch of demos and exchanged more business cards. I noticed that many companies are looking for ways to enable easy authoring in DITA for people who wouldn’t go near a full XML editor. There wasn’t enough time to get to all of the vendors and I was getting pretty beat by this time, so I went to the hotel to write this before I dropped. I received a massive amount of DITA (and related) info today, and there is still a day and a half left. But I’m not tired of it and I look forward to tomorrow morning! Hello, I’m your guest blogger! I volunteered to do some on-the-ground posts about the CIDM CMS/DITA 2013 conference in Providence, Rhode Island. This is the first installment. The conference starts tomorrow, but tonight I attended a reception for attendees with drinks and light food. 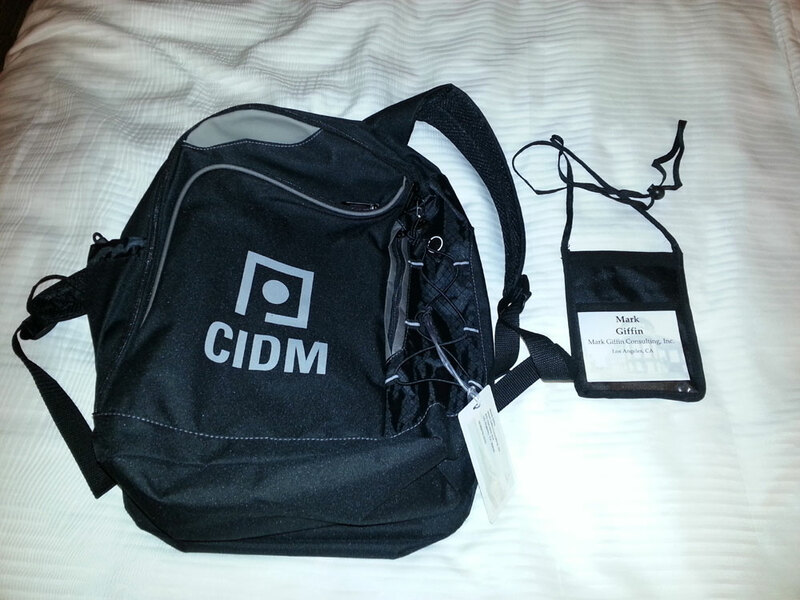 Here is the swag they passed out as I signed in: a nice backpack sporting the CIDM logo, and my attendee badge. There was a lot of drinking, eating and talking going on. 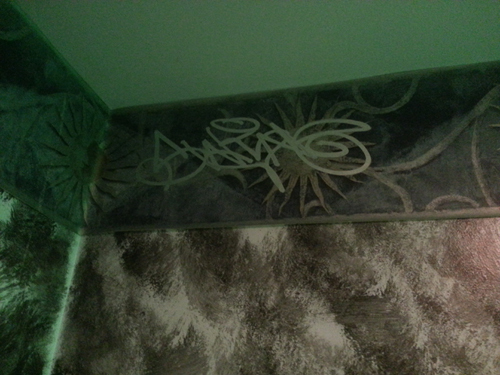 I really should have taken some pictures of the room. I will make up for this later. I had a beer and ate a lot of green and red peppers while walking around the room introducing myself to people and exchanging cards. I’m here to learn things and promote my services. It was very fun to meet Radu Coravu and George Bina of SyncRO Soft, makers of the excellent Oxygen XML editor. They are from Romania. I also talked to Eliot Kimber, markup wrangler par excellence and one of my heroes. He had flown in from Austin and was wearing a kilt. I also met and talked to Don Day, co-chair of the OASIS DITA Technical Committee. He was one of the original people working on the DITA standard, and I enjoyed discussing using DITA on-the-fly for websites. I’ll guess the room had over 200 people in it at its peak. Tomorrow morning starts at 7am for a provided breakfast, and then the speakers and presentations start! I’m excited! More tomorrow.